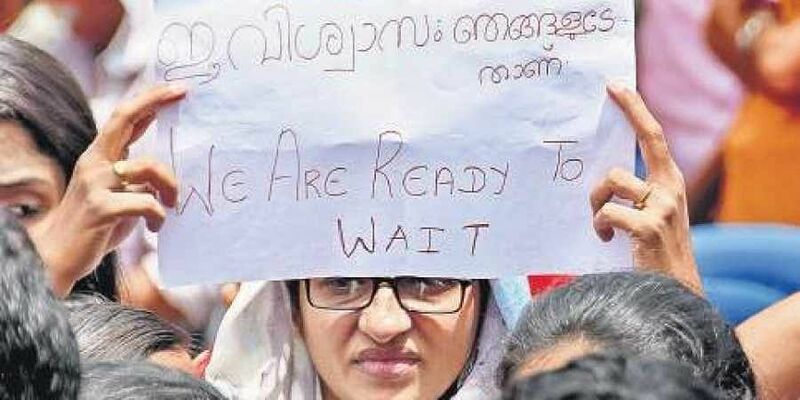 Thousands of Hindu women are out in the capital city streets against the Supreme Court verdict allowing entry of women of all ages to the Sabarimala Lord Ayyappa temple. THIRUVANANTHAPURAM: Thiruvananthapuram city, known to the world for hosting the largest religious gathering of women on earth, the Attukal Pongala, is making headlines for a different reason. The agitation may appear paradoxical to some, but not for the numerous women protestors - from students to the aged. Wednesday and Thursday saw massive protests in front of the Secretariat urging the state government to promulgate an ordinance to overcome the court verdict. Anjana Suresh, state secretary of the Bharatheeya Vichara Kendram, one among the organisers of the protests said the attendance of supporters taking part in rallies have taken her by surprise. “Woman believers are pouring in from different parts of the state without any formal campaigning. They are deeply hurt by the verdict,” she said. Among the naysayers on lifting the 10-50 age bar at the shrine is Gayathri K Mohan, a 28-year-old architect hailing from Attukal. She had visited the shrine thrice before she attained the age of 10. “This is a strange case in which Hindu women are given an option which they don’t need. In fact we believe that lifting the age bar is against the tantric customs of the temple and would affect its sanctity,” she said. She is joined by Anjana who points out that the Sabarimala case did not involve gender bias. “There is no blatant ban, only a restriction, that too in accordance with the celibate nature of the deity. It is not the other way round - not because of any problem with the women,” she says. Maya, 30, a researcher with the Kerala University, feels that the restriction at the shrine was non-offensive and part of the vivid customs and traditions in the Hindu religion. “One should not look for logic in religious practices. It is only about getting mental peace. External scrutiny is needed only when there is a violation of rights,” she says. The argument that the ban is rooted in the taboo on menstruation has not gone down well with many devotees. Maheswari, a protestor in her fifties, says menstruation is revered in the Hindu tradition. “I belong to a community which celebrates menarche with sweets and get-together of relatives,” she said. “Linking menstruation with the ban is a plot by some so-called feminists who wanted to destroy the fame of the shrine. I wonder why the state is imposing a condition which the believers do not want?” she asks.